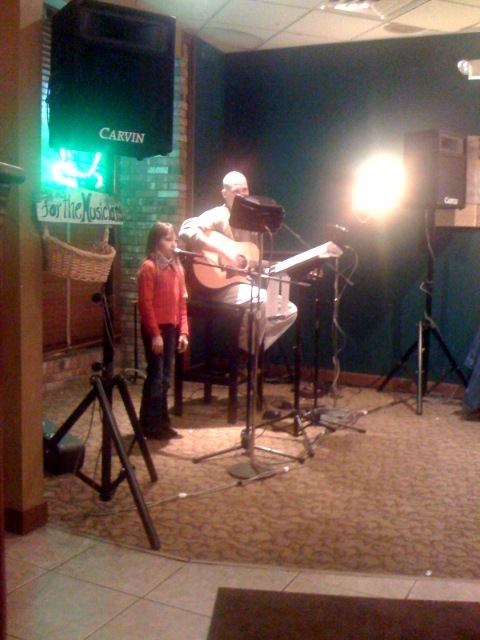 This little girl sang for the first time in front of people with her dad in front a small coffehouse full of people. It was a wonderful time. A nice reflection of a daughter and father sharing a gift. Sometimes I wonder if God looks at me the same way. Like, when I get down on my knees or I close my eyes to pray and as I get ready to speak, He leans over the edge of Heaven so He can really pay attention to exactly what you are saying. Not so much what’s coming out of your mouth as what’s coming out of your heart. Recently, I’ve been evaluating my prayers to God and I’ve realized that I am trying to “pray right.” I am trying to say things that I think God would be happy to hear. I am trying to say things that will get me to a desired outcome instead of crying out, speaking, asking, singing or simply standing in His presence. This little girl didn’t move once she got behind the mic…she had a small voice, audible only because of the piece of technology standing inches from her mouth. I don’t want to just say prayers to God. I want to communicate. I want to engage, I want a relationship. I don’t want a monologue, I want to dialogue with God. Where I take, He not only hears, but listens and where He talks and I not only listen and hear, but am transformed by His words. Speak up. You don’t need a mic when talking to God. He’s closer than you think. This entry was posted in blog, hmm..., personal, thoughts, worship. Bookmark the permalink.